What other way to welcome a new neighbor than by baking cookies for them? Richard Manfredi in Westerly, Rhode Island had other plans for his new celebrity neighbor. Taylor Swift received a warm welcome message in the form of a corn field maze. 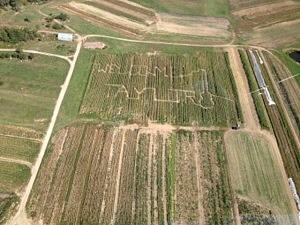 Manfredi, who owns Manfredi Farms, mowed the message, “Welcome Taylor” with a guitar into his eight-acre corn maze. Swift recently bought a $17 million home in Rhode Island.